A cultural shift in the workplace driven by millennials has caught many business leaders sleeping. Leaders are ill-equipped to cast the vision for the “new” workforce because they don’t know what motivates and inspires them. These younger workers won’t be motivated by mere money—they need an emotional stake in the game. 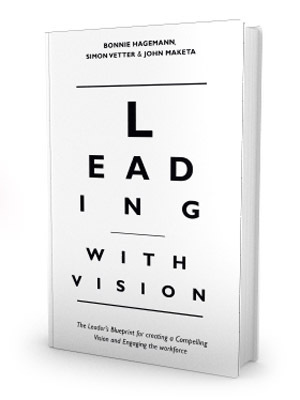 Leading with Vision provides leaders with a research-based blueprint for getting there. Leading with Vision is a practical approach for current and aspiring leaders to defining, articulating and sustaining a compelling vision in order to connect with employees on an emotional, rather than cognitive level. It features interviews, stories, and examples from leading executives, present and future, from well-known companies including: Bumble Bee Foods, Siemens, Alibaba, Jimbo Supermarkets, Patagonia and more. The authors will show you how to captivate today’s workforce, abolish the daily grind and create an environment where employees take the stairs to work two at a time.